The Lions dogpile to celebrate their 2015 state championship. Oviedo made school history by winning the Class 7A state championship on Thursday evening. The Lions dispatched Sarasota 9-5 to earn their place in history, setting off a raucous celebration on the field at jetBlue Park in Fort Myers. It was Oviedo’s first time in the state championship, after falling in the semifinal round in four previous appearances dating back to its first trip to states in 1986. The Lions (27-5) broke things open with two outs in the top of the first inning. Ty Powell and Ryan Anderson were both hit by pitches, and catcher JJ Woodard delivered a double to center field to push both players home and get the scoring started. Corey Shearer came in to run for Woodard, and he quickly advanced into scoring position thanks to a single from Christian Arroyo. Austin Parker followed with an RBI single to drive home Shearer, and Shane Miller added an RBI single to plate Arroyo and give Oviedo a 4-0 advantage. Oviedo increased its lead in the top of the fifth. Woodard singled to left field, and Arroyo jumped on a 2-0 offering and crushed it over the Green Monster for a two-run home run and a 6-1 lead. The club continued to pound away to put things out of reach with three more runs in the sixth. Shane Miller singled to begin the inning, and then moved to second on the strength of a sacrifice bunt from Cameron Peppiatt. Deacon Liput put runners on the corners with a ground-ball single to right field, and Ty Powell singled to left to drive in Miller. Carlos Cortes sent a fly ball to center for a sac-fly that pushed Liput across the plate, and an Anderson single allowed Powell to come in and push the lead to 9-1. Sarasota (20-11) got on the scoreboard with a run in the bottom of the second. Nick Long worked a leadoff walk, Carson Kyser followed suit and then gave way to courtesy-runner Kyle McMullen. Adam Imwalle loaded the bases on a single to center, and Matt Schlabach deposited an RBI single on a liner to left that drove in Long for the Sailors’ first run of the contest. Cameron Peppiatt picked up the win with five gritty innings on the mound. True to the grit the team has shown all throughout its playoff run this year, Sarasota continued to battle back even after falling into a very deep hole. Imwalle and Schlabach both singled to start the bottom of the sixth, with Imwalle then coming home on an RBI groundout from Aidan Wolfe. Frey came through with an RBI single that plated Schlabach and kept the pressure going, and Cody Brickhouse increased that pressure when he lined a double just fair along the left field line for a double that pushed Frey across the plate. Arroyo came up with another big play for his team that ended the threat, as he tracked down a pop fly in front of the first base dugout to make the catch even despite colliding with Woodard in the process. 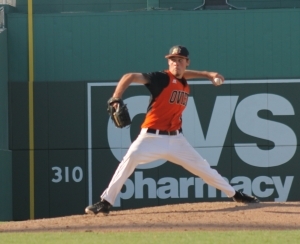 Peppiatt picked up the win on the mound for Oviedo, working through five innings while scattering six hits and four walks and picking up three strikeouts. Although the Sailors threatened to get back into the game several times, Peppiatt was able to work out of trouble and hand a big lead off to reliever Nick Logan. Logan also faced some adversity as the tenacious Sailors continued to battle to the very end. Down to its final out in the bottom of the seventh, Schlabach continued to give Sarasota hope by connecting for a double to deep to left field. Arauz came through with an RBI single to right field that allowed Schlabach to score, but Logan induced a fly ball to Cortez in center field for the final out that sealed the victory.